During the fourth inning of the Diamondbacks game against the Los Angeles Dodgers on April 10, the line for the infamous Churro Dog ran only four deep. The dessert was the talk of the town during spring training, but at that point in the Diamondbacks game there wasn’t much demand for it. Other food and beverage items across MLB parks are in the same boat now with a faster-paced game possibly affecting sales. Through April 20, the average game was two hours, 59 minutes, according to Baseball Prospectus. That time shaves nine minutes off last year’s average. 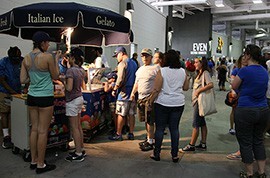 Food and beverage vendors haven’t seen major dips in sales since the rule changes hit the Major Leagues during spring training. Of course, the sample size is small thus far, with the regular season just a few weeks old and after a month of Cactus League games. Robert Brackett, the food and beverage general manager at Salt River Fields, said concession sales hadn’t declined significantly enough to pose a problem. Given that, he isn’t worried about the pace of the game hurting sales. In Arlington, Metroplex Sportservice runs food operations for the Texas Rangers. Director Shawn Maddox said it’s not their intent to keep fans waiting in line for long periods, especially during games. And, like at Salt River Fields, there are no early indications the pace of play changes will hurt concession sales. While vendors aren’t worried about pace of play now, other factors could affect sales. Maddox said that restaurants outside ballparks also pose a challenge. After all, not everyone who goes to a game buys food inside the stadium. Fans have other options. Maddox also said a team’s success or injuries to opposing stars can affect attendance numbers and concession sales. “There are other things going on in a ballpark’s vicinity,” he said. 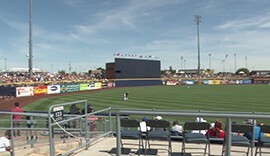 Fans at Salt River Fields during spring training said a faster game won’t change their approach to the concession line. While David Smith and Frank Passarelli watched the Diamondbacks and Rangers play March 31, Smith said he doesn’t frequent the concessions often, so any future changes in prices won’t affect him. “As long as the beer is cold and the hot dogs are hot,” Passarelli interjected. The new rules are supposed to decrease downtime between innings. Diamondbacks President Derrick Hall said the changes should attract a younger fan base, but there’s still the older crowd to think about. A “purist” of the game like David Smith doesn’t think so. Baseball fans have mixed emotions about Major League Baseball's efforts to help speed up the game. Concession vendors receive most of their business prior to games, meaning a faster game won’t bring down sales.